to authoring new posts in Sandburg's Hometown! This should be #274! April is commonly considered to be a rainy month. The rain is especially helpful to growing flowers lawns and trees. We may complain about the weather, but we get out our collapsible umbrellas and carry on. Carl Sandburg never mentioned the umbrella in his autobiography, Always the Young Strangers. More than likely the family could not afford to buy one. To feed and clothe a family of seven children on the pay provided by the railroad was truly difficult. In fact, young Carl wore shoes until the soles were loose and the upper portion cracked because there was no money to buy new shoes. He was not protected from the rain, cold or snow on his treks to work. When he worked for Sam Barlow delivering milk, Mrs. Barlow bought a pair of overshoes for Carl. He didn’t catch a cold that winter. 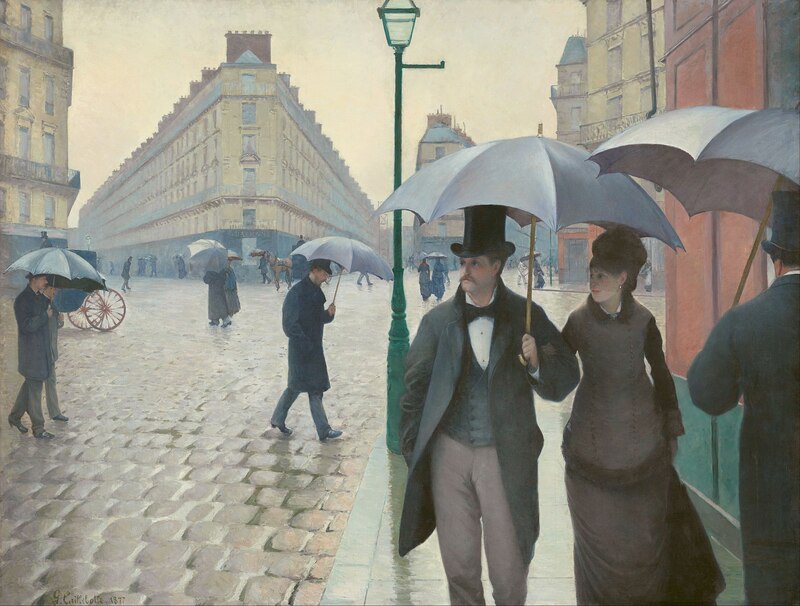 The umbrella is described as a folding canopy to protect the person holding it from the rain. A parasol is usually of lighter material and is used to shade a lady from the sun. They come in all sizes, colors and designs to shield one person, golf players or a patio table. The Chinese invented the umbrella in the sixth century before the Common Era began. It was a circle of fabric or oiled paper mounted on a pole. A slave or servant carried the device to protect an important person. The idea spread from there via the Silk Road to Persia, Egypt, Greece and Rome. Wealthy Roman women were especially attracted to the umbrella to protect their skin from the sun. Being rich enough to have a slave or attendant to carry the umbrella was a true status symbol. After the fall of Rome the umbrella disappeared for about a thousand years. It reappeared in France and England in the eighteenth century. In this period using an umbrella meant that the individual wasn’t wealthy enough to own a carriage with horses to pull it. An Englishman by the name of Jonas Hanway insisted upon carrying his umbrella at all times. The custom took hold and continues to today in Britain. Queen Elizabeth carries a “bubble” umbrella of clear material so crowds can still see her face under it. The trim on the umbrella is color coordinated with her clothing. Most umbrellas are manufactured in China. About thirty million are sold in the United States each year. We have umbrellas in our cars, handbags and closets ready for use. If there is wind with the rain, a collapsible umbrella usually turns inside out and is of no use. Inventors are working on new kinds of umbrellas that can withstand fifty mile per hour winds. April 1, 2019 "Removal of an Old Landmark"
March 18, 2019 "The Song of the Shirt"
February 18, 2019 "Remember the Maine"